Throwing a Hello Kitty theme party? 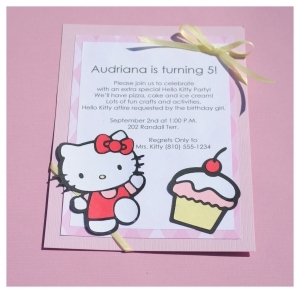 Making your own Hello Kitty invitations can be a great project for the guest of honor. Assuming that the particular guest of honor is most likely a young girl! LOL! Hello Kitty is classic! And has also become a phenomenon amongst young women alike. It was popular when I was a little girl and my obsession remained intact up past my teen years. I have now managed to somehow pass this on to my three year old daughter who is completely obsessed! Yes, oh yes, "obsessed" may be putting it mildly. :-) She has several Hello Kitty dolls, one of which she built at Build-a-Bear and is dressed in head to toe Hello Kitty clothes right down to tiny undies with a hole cut out for the tail. She has Hello Kitty posters, Hello kitty bedsheets, coloring books, clothing, etc. You name it - she has got it! 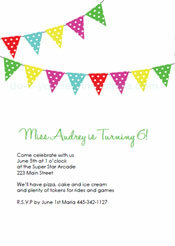 So naturally her next party will be a Hello Kitty party and some Hello Kitty invitations are in order. I managed to wrangle up some Hello Kitty scrapbooking paper, so I thought this was a great way to put together a really simple invitation with a cute and crafty edge. These were really easy to put together! I started with a blank card to put this invitation together. You can also simply use some cardstock and fold it in half. Make sure and score it first if it is a especially heavy cardstock. Otherwise run a straight edge like the side of a ruler over the crease after folding. This will iron out any messy looking creases over the fold. I also tend to like to use 12x12 cardstock when I use scrapbook paper. It tends to make things a bit easier. 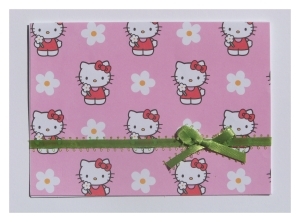 All you'll need to do is cut both the decorative Hello Kitty paper and cardstock in half and then fold them both. Layer them together and you're about done! 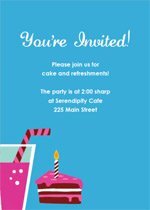 You will want to start out by printing the party invitations wording to the inside of the card. It is sometimes easy to print it onto plain white printer paper and then attach it to the inside of the card for a more layered look. This gives the invites a bit more texture and crafty feel. Using the blank card I measure the front of the card and then cut my Hello Kitty paper to the exact same measurements. I applied some adhesive to the back and attached it to the front of the card. If you decide to use two 12x12 papers then just fold them both and repeat the same steps, applying adhesive to the back of the HK paper and then layering it over the folded acrdstock. To top the card off you can add a bit of ribbon running across the front of the card. I glued a piece of ribbon straight onto the front of teh Hello Kitty invitations and then added the bow afterwards. I tied it and trimmed the ends off, attaching it with a bit of permanent adhesive with my glue runner. You can also use some glue dots. These invitations are mostly basic, with the addition of some Cricut die cut pieces. There are a bunch of Hello Kitty birthday theme die cut shapes, so much possibility for different combinations of birthday Hello Kitty invitations. Lots of cake and balloon types of themes. But if you are the type to create crafts all through the year there is also seasonal and holiday themes to play with. The base of this card is mostly simple. I started by cutting some pink cardstock to 5" by 7" rectangles for the base of the invitation. I found a coordinationg patterned paper and cut it to 4 1/4" by 6 1/4". I applied some adhesive to the back of the patterned paper using a glue runner and then attached the paper onto the cardstock centering it as best as I possibly could. Next I printed the wording for the front of the invitation onto plain white paper. I set it up to print within boxes which I sized at 3 3/4" by 5 3/4". After cutting them out I used the box around the type to use as cutting marks. I trimmed the wording from the paper and then applied adhesive to the back in the same manner. I centered them on top of the papers already layered onto the card. To attach the ribbon I wrapped it around the bottom left corner of the card and criss crossed it on the back of the card. I used a little dab of scotch tape to hold it in place where I criss-crossed. I then puller the ribbon up over the opposite corner of the card and tied a little ribbon. I find that it is easiest to tie a little knot, look and see where the knot will land, and then place a little dab of adhesive in that spot to hold it doen. I then tied a little bow carefully with the ribbon. After I adjusted the bow so it was just right, I snipped the edges hanging off to trim them to be even. The last and hardest, most tedious step, was to cut out all of my shapes using the Cricut. I recommend getting help with this so it is not overwhelming. If you are not making too many invites then it is not too bad. My first bit of advice is to try to make the pieces you are cutting as big as you can get them to fit on the card and still look pleasing to the eye. Some of the shapes can get tricky to cut out at very small dimensions. If you need to go small, pick die cuts with less detail. It is imperative that you make sure your paper is held very firmly onto the cutting mat. One little trick I have learned, is that if your cutting mat is losing some of it's stickiness, try spraying some spray adhesive onto it. Works wonders! BUT, it will transfer some of that stickiness to your paper. This is a welcome side effect when you are making these Hello Kitty invitations. Another tip - arrange all of the pieces before you atrt glueing them down. If you start at one corner and start glueing blindly and even one piece is in the wrong place, it ruins tyhe whole effect. I topped off the entire ensemble by attaching the Hello Kitty die cuts using my glue runner! They came out very cute and my little girl just loves them! For more ideas and inspiration for Hello Kitty theme parties head on over to Pink-heaven-party-ideas.com where you can find tons of ideas for your upcoming Kitty party and other great ideas for girly parties. Party ideas for kids, teens, adults and holidays, all with the Pink Heaven magical sparkle!